Chris Kamm became an apprentice woodcrafter in 1982, after experience in banking and finance. In 1995, he entered a box design contest, and was surprised to find that people loved them. 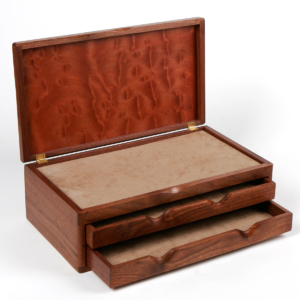 He now devotes nearly all of his studio time to his beautifully crafted boxes. Chris feels that the surprise inside is just as important as the exterior, so the outsides of his boxes are kept simple and spare, and the inside completes the expectation of what the box might be used for. 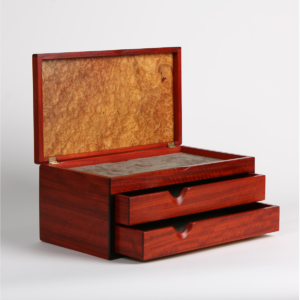 His simple, elegant designs with dramatic materials make his boxes the perfect secret place for treasures.